Review of Magic Hat "Hex" Ourtoberfest | Beer Apprentice - Craft Beer News, Reviews, Interviews and Info. 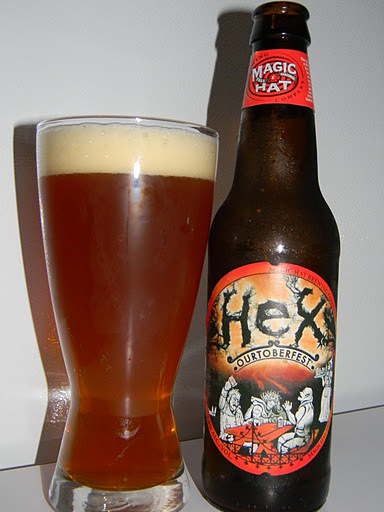 For today’s craft beer review I thought I would try the Fall seasonal offering from the Magic Hat Brewing Company located in Burlington, Vermont called the Magic Hat “Hex” Ourtoberfest. Magic Hat seems to always put some kind of abnormal twist on their brews, so I’m wondering what it will be with this one. From the website, magichat.net, we find this description. A malty amber ale with hints of toffee and caramel and a slightly smoky finish. The brew has an ABV of 5.4% and comes in a 12 oz. bottle. The beer poured a little bit hazy. It was an amber to light copper color with some burnt orange highlights around the bottom and sides of the glass. The head was relatively small in size, although the retention time was ok. It was smooth and creamy looking and left behind some decent lacing as it settled. The aroma began with a significant dose of caramel malt and brown sugar. Well balanced tones of lightly toasted wheat bread and earthy hops complimented the sweetness very nicely. Deeper in the fragrance, I started to detect a hint similar to buttered bread along with a slight grain bill. This beer smelled pretty good I thought. The taste brought forth more of the caramel malt sweetness. More prominent savors of grain came through in the taste than did in the aroma too. Grassy hops gave a slight tickle to the sides of the tongue, however the bitterness was only “so-so.” Lightly toasted bread notes were noticed just as they were in the aroma. All the flavors seemed to be harmonized well. The longer I sipped the greater the grainy aspects showed themselves however. The mouthfeel was medium, smooth, crisp, dry and somewhat refreshing. A decent amount of flavor was left behind on the palate. Not bad. Well, this beer is just “ok” in my opinion. It’s nothing horrible or off putting, however I didn’t find it to be anything outstanding either. With that being said, I’d drink it again if it was offered for sure. It was easy to down and it really fits the season. I was expecting something a little more “experimental” from this beer, but I never really found it. It’s relatively straight forward actually. Other than that, there’s not much left to say except that if you see it sitting on the shelf, give it a try and enjoy it as the Fall gives way to Winter. Thanks for reading and commenting everyone. Also, thanks to all the new followers of the blog. That means a great deal to me to know that you are somewhat interested in the reviews I post. Feel free to contact me via Twitter (@BeerApprentice and @shrews824) or Google+ (Scott Shrewsberry) if you would like to speak to me further about craft beer.